The recent leak of a Greenpeace anti-coal strategy document has diverted attention from the real scandal: the mining industry is gearing up for an exponential increase in Australia’s already massive fossil fuel exports. 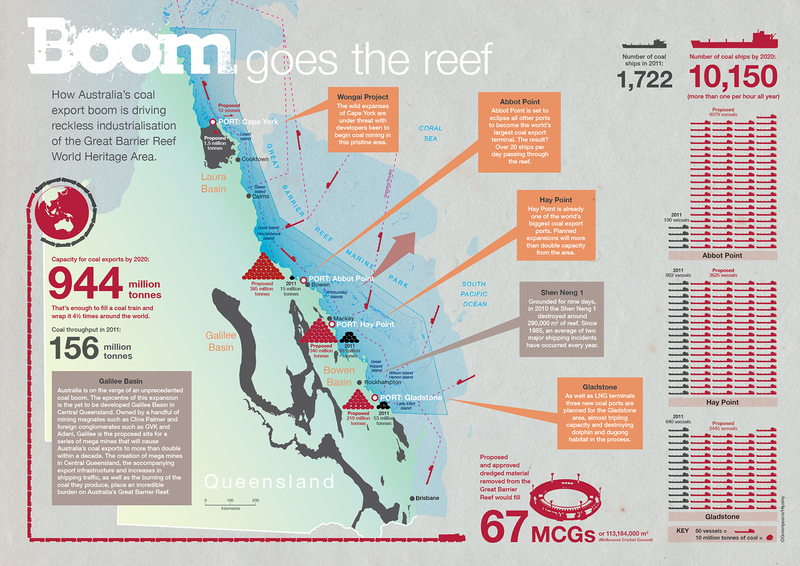 The centre of activity is the Galilee Basin in Queensland, where companies are planning “mega-mines” and infrastructure to extract nearly a billion tonnes per year of coal, not to mention coal seam gas, and ship it through the Great Barrier Reef World Heritage Area. The scale of it is almost unimaginable, and the CO2 emitted when all this carbon is burned overseas will be many times larger than Australia’s emissions at home. Australia’s domestic CO2 emissions, excluding land use, are 400 million tonnes per year (Mt/yr), 1.2% of global fossil fuel CO2 emissions which total 33.4 billion tonnes per year (Gt/yr). If you include other greenhouse gases, Australia’s domestic emissions are 546 Mt/yr CO2-equivalent, and if you include land use they’re 600 Mt/yr. It is these emissions which the Gillard Government’s carbon price promises to reduce by at least 5% by 2020, though the Government prefers to frame it as a cut of 160 Mt in 2020 compared to the emissions growth projected to have occurred otherwise. Much of the claimed reduction could come from dubious international offsets, so there may not even be any absolute emissions cut domestically, but let’s be generous and grant the Government a saving of 160 Mt. Australia is already the Earth’s largest coal exporter, dispatching 285 Mt/yr, 30% of the global coal trade. Assuming each tonne of coal burned emits 2.7 tonnes of CO2, these existing exports account for emissions of 770 Mt/yr, 2.3% of global fossil fuel emissions and greater than all domestic activity. That’s today. According to Greenpeace, currently planned projects could almost quadruple that in a decade, increasing national coal exports by ~800 Mt/yr and hence emissions by ~2 Gt/yr. Plus, according to the Government’s Draft Energy White Paper, liquid natural gas exports could increase from 20 Mt/yr to 70 Mt/yr, adding another 140 Mt/yr CO2. In other words, expansion of fossil fuel exports could add 14 times as many emissions as the 160 Mt supposedly saved by Australia’s domestic carbon price. That would bring Australia’s total fossil fuel exports in 2020 to over 3 Gt/yr: 9% of current global fossil fuel emissions, five times Australia’s domestic emissions, and twice Saudi Arabia’s current fossil fuel export emissions. The majority of the planned development is in Queensland. Up and down the coast new ports are proposed, as well as massive upscaling of existing ports at Abbot Point, Hay Point, and Gladstone. The biggest development is at Abbot Point, which is intended to increase its coal export capacity to 385 Mt/yr, making it three times bigger than any coal export port in the world. Hay Point is already one of the world’s largest, and its capacity is planned to more than double to 340 Mt/yr. Gladstone’s capacity would increase to 219 Mt/yr. Greenpeace argues the single most important piece of infrastructure is a rail line to the Galilee Basin. All in all, the boom could sextuple the coal export capacity of ships traversing the Great Barrier Reef area from 156 to 944 Mt/yr, and the number of ships from 1,722 to 10,150. That’s one ship full of coal per hour, 365 days a year! Figure 1: Visual depiction of proposed fossil fuel export expansion in Great Barrier Reef World Heritage Area (Greenpeace 2012). Click to enlarge. Then there’s 113 million cubic metres of dredging either approved or proposed to make way for all these ships. The local impacts on the reef have led UNESCO to question whether it should remain a World Heritage Area; places designated as such are supposed to be preserved. Moreover, a major reason why the Great Barrier Reef was in the first place declared a Marine Park, and later World Heritage Area, was to prevent mining in the region. UNESCO visited Australia last week to investigate, and will make a decision in mid-2012. In a cruel irony, the global warming and ocean acidification caused by rising carbon dioxide will quickly destroy coral reefs – so the planned development is a triple whammy for the Great Barrier Reef. In addition to the Galilee Basin, Greenpeace also highlights planned expansion of coal mines in the Hunter Valley in New South Wales, and attempts to begin exporting coal from Victoria and Western Australia. Just yesterday, The Age revealed the Victorian Government is planning a gargantuan brown coal mine, and even a public relations campaign to “address community concerns about the ongoing use of brown coal in a carbon-constrained future”. This new proposal threatens to make fossil fuel exports even bigger. Scientists at Germany’s Potsdam Institute estimate that to have an 80% chance of limiting warming to 2°C (which is not even a safe target), we can afford to emit only 565 Gt CO2 between now and 2050. Based on a very rough back-of-the-envelope calculation, Australia’s fossil fuel exports during 2012-2050, combined with domestic emissions during 2012-2050, could amount to as much as a fifth of that global carbon budget. The scale of all these numbers surprised even me. Greenpeace’s estimates seem higher than Treasury’s (though the two are difficult to compare). The Australian Coal Association claims Greenpeace is exaggerating because not every project will come to fruition. But the question of whether coal exports are likely to double, triple, or quadruple is in a sense academic. Even if I overestimated by a factor of two, Australia would still take up a tenth of the global carbon budget. The point is fossil fuel exports should not be growing at all; they should be phased out as quickly as possible. Australia washes its hands of fossil fuel exports. We are able to get away with this because under internationally agreed accounting, countries are responsible only for emissions occurring within their own borders. The problem is that international negotiations are not getting anywhere, and the developing countries importing our fossil fuels don’t currently have absolute emissions reduction targets. In any case, the fact that Australia profits from our exports means Australia has at least a share of the ethical responsibility. If they’re not our responsibility and we’re providing Asia with fossil fuels out of the goodness of our hearts, then we shouldn’t accept money for them. Phasing out fossil fuel exports would make a very real difference. Australians often say Australia is too tiny to have any impact on the climate, but our fossil fuel exports are anything but tiny. Some of our exports go to emerging economies like China. Next time you hear someone say Australia’s actions are unimportant in the context of Asia’s growth, remember our fossil fuels are helping to fuel their growth. If we choose to, we could make the world sit up and take notice. What about the industry’s argument (or perhaps I should say threat) that restrictions in Australia will cause production to move to other countries? There may be some truth to this, but if everybody followed that reasoning then nobody would ever do anything. Unilateral action is required to get a momentum for global action. Whichever way you look at it, ensuring Australian coal stays in the ground would go a considerable way towards combating climate change. Other countries can’t necessarily expand their coal production on the same scale as Australia. Australia is the fourth largest coal producer; China and India, the first and third largest respectively, are coal importers. Fossil fuel exports are an economic risk for Australia in the event of the carbon bubble bursting. Of course, the far worse risk for humanity is that there will be continued demand for our exports, with all the climate impacts that entails. Phasing them out may be economically difficult, but better to start now than wait until they have doubled, tripled, or quadrupled. It would also help other industries by bringing down the Australian dollar. Environmental groups should be loudly campaigning against fossil fuel exports, but at the moment most (excluding Greenpeace) are not even trying. Nobody else is going to do it. Globally, time is fast running out to preserve a safe climate. The Australian coal industry’s main market is in exports, and most of its proposed exports are on track to be locked in within two years. The Abbot Point port expansion was approved by the Queensland Government last December and federal approval is due this December. This issue cannot wait until the next election! We cannot continue to pretend our exports are not our responsibility.